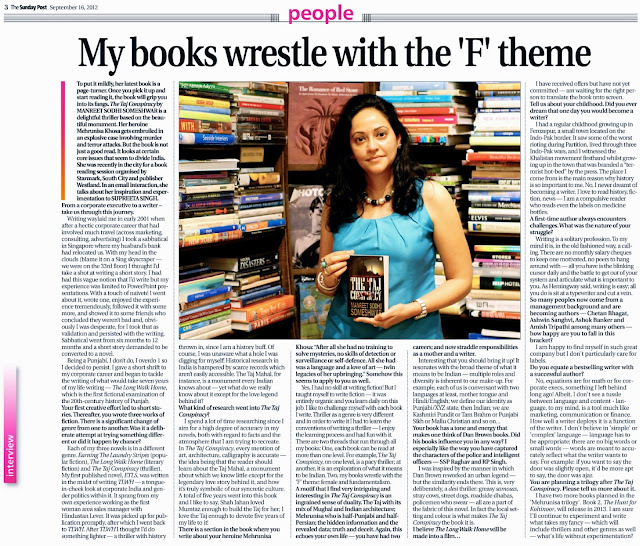 An in-depth interview with The Bengal Post on Writing, The Taj Conspiracy, Historical Fiction and What it Means to Be Indian! Since the fine print might render reading difficult, below is a transcript of the interview. 1. From a corporate executive to a writer – take us through this journey. Why did you decide to take a break? The shift should have prompted certain changes in your own life because being a writer is so different from being an author! How did you adapt yourself to this sudden change in career path? The Long Walk Home, which is the first fictional examination of the 20th-century history of Punjab. 2. Your first creative effort led to short stories. Thereafter, you wrote three works of fiction. There is a significant change of genre from one to another. Was it a deliberate attempt at trying something different or did it happen by chance? 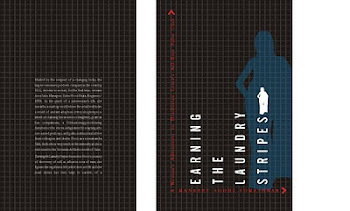 Each of my three novels is in a different genre: Earning The Laundry Stripes (popular fiction), The Long Walk Home (Literary fiction), The Taj Conspiracy (thriller). My first published novel, ETLS, was written in the midst of writing TLWH - a tongue-in-cheek look at corporate India and gender politics within it, it sprang from my own experience working as the first woman Area Sales Manager with Hindustan Lever. It was picked up for publication promptly, after which I went back to TLWH. After TLWH I thought I’d do something lighter – a thriller with history thrown in, since I am a history buff, seemed ideal. Of course, I was unaware what a hole I was digging for myself Historical research in India is hampered by scarce records which then aren’t accessible easily. The Taj Mahal, for instance, is a monument every Indian knows about – yet what do we really know about it except for the love legend behind it? 3. *The Taj Conspiracy* is steeped in history. What kind of research went into it? From conceptualising to execution to publication – how long did the process last? art, architecture, calligraphy is accurate – the idea being that the reader should learn about the Taj Mahal, a monument about which we know little except for the legendary love story behind it, and how its truly symbolic of our syncretic culture. A total of 5 years went into this book and I like to say. Shah Jahan loved Mumtaz enough to build the Taj for her; I love the Taj enough to devote 5 years of my life to it! 4. There is a section in the book (page 125) where you write about your heroine Mehrunisa Khosa: “After all she had no training to solve mysteries, no skills of detection or surveillance or self-defence. All she had was a language and a love of art – twin legacies of her upbringing.” Somehow this seems to apply to you as well. Comment. Writing detective fiction requires a set of skills very different from writing novels in other genres. What went through your mind as a writer when you were writing a thriller? How did you equip yourself to face the challenge? And do you see a common thread that binds all your novels together? Yes, I had no skill at writing fiction - indeed my experience was limited to powerpoint presentations! But I taught myself to write fiction - it was entirely organic and you learn daily on this job. I like to challenege myself with each book I write. Thriller genre is very different and in order to write it I had to learn the conventions of writing a thriller - I enjoy the learning process and had fun with it. There are 2 threads that run through all my books: One, each book can be read at more than one level. For eg: The Taj Conspiracy, on one level, is a pacy thriller; at another, it is an exploration of what it means to be Indian. 5. A motif that I find very intriguing and interesting in *The Taj Conspiracy* is an ingrained sense of duality. The Taj with its mix of Mughal and Indian architecture; Mehrunisa who is half-Punjabi and half-Persian; the hidden information and the revealed data; truth and deceit. Again, this echoes your own life – you have had two careers; and now straddle responsibilities as a mother and a writer. Please comment. 6. Your book has a tone and energy that makes one think of Dan Brown books. Did his books influence you in any way? I especially like the way you have captured the characters of the police and intelligent officers – SSP Raghav and RP Singh. Most of the young readers in our country are fed on English books when it comes to thriller. Did it ever bother you that a local setting and context just might play spoil sport with the story? Conspiracy the book it is. 7. You are planning a trilogy after *The Taj Conspiracy*. Please tell us more about it. Would thriller be your genre now or would we see you moving onto something else? I have two more books planned in the 'Mehrunisa trilogy'. Book 2, The Hunt for Kohinoor, will release in 2013. I am sure I'll continue to experiment and write what takes my fancy - which will include thrillers and other genres as well - what's life without experimentation? 8. I believe The Long Walk Home will be made into a film? Please shed light on it. I have received offers but have not yet committed - am waiting for the right person to translate the book onto screen. 9. Tell us about your childhood. Did you ever dream that one day you would become a writer? What kind of books do you like to read? I had a regular childhood growing up in Ferozepur, a small town located on the Indo-Pak border. It saw some of the worst rioting during Partition, lived through 3 Indo-Pak wars, and I witnessed the Khalistan movement firsthand whilst growing up in the town that was branded a “terrorist hot-bed” by the Press. The place I come from is the main reason why history is so important to me. No, I never dreamt of becoming a writer. I love to read history, fiction, news - I am a compulsive reader who reads even the labels on medicine bottles. 10. A first-time author always encounters challenges/obstacles. What was the nature of your struggle? Since you were already established in another career, and let’s say, that you shifted to writing later – do you think such a situation affected or influenced your struggle differently? What turns you on as a writer? Writing is a solitary profession. To my mind it is, in the old fashioned way, a calling. There are no montly salary cheques to keep one motivated, no peers to hang around with - all you have is the blinking cursor daily and the battle to get out of your system and articulate what is important to you. As Hemingway said, writing is easy; all you do is sit at a typewriter and cut a vein. 11. So many authors now come from a management background and are becoming authors – Chean Bhagat, Ashwin Sanghvi, Ashok Banker and Amish Tripathi among many others – how happy are you to fall in this bracket? I am happy to find myself in such company but I don't particularly care for labels. 12. Do you equate a bestselling writer with a successful author? I once had a conversation with Amish about the tussle between language and content – and the prudish assertion that bestselling books are not literary engagements – and how it effects one as an author. What are your observations on this? apt to say, the door was ajar. Inspiring. Thank You for sharing this Manreet. Wish you contentment and joy in all your future endeavours. Nice interview. Makes me want to pick up Taj Conspiracy and author's other books. But some errors are there. You refer to author as 'first-time author' but she has other books previously. Also in list of authors from management background you have mentioned Chean Bhagat (spelling? ), Ashwin Sanghvi (spelling? ), Ashok Banker (who is not from management background) and Amish Tripathi. Please ensure errors are corrected.